Halloween is one of my favourite holidays to celebrate, partly because it is a lot of fun to decorate my house inside and out. I seem to buy new decorations every single year and my husband has finally put his foot down this year and gave me a budget. Being the crafty, savings-type person I am, I decided instead of buying new things this year, I am going to make the decorations myself. Not only will this save us money, but my kids can join in the fun and make some scary and spooky decorations as well. I hit up some great websites to see if I could find some DIY decorations and was shocked at how many awesome ideas are out there. 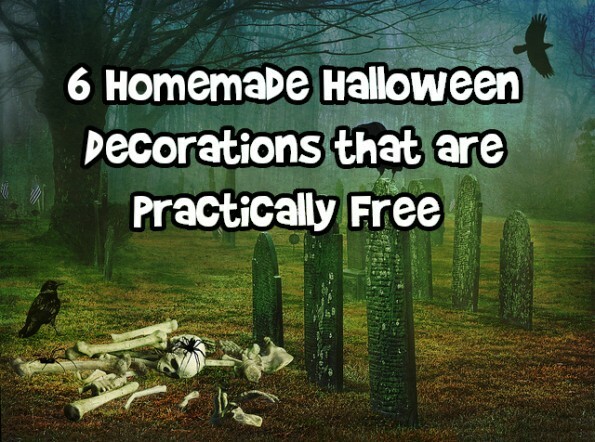 Here are a few of the great inexpensive Halloween decoration I found online, that you can make yourself. Some of them are creepy, some of them are kid friendly but all of them are perfect for this holiday. This idea from Keeping It Simple is such a fun idea for the whole family to do. Instead of buying the supplies like they suggest, I suggest you use toilet paper and make your own mummy eyes out of cardboard. I have a family of four so we go through a lot of milk jugs and usually just recycle them. This is a great way to recycle them in a different way. The easy directions are on Eighteen25 so you can make your own. This is definitely a creepy decoration but I love it! Just make some cardboard cutouts in the shape of people, paint them black and cut out the eyes. I found this at Brastwurst Tumblr and it would be perfect for a party. With this DIY craft, you can use some items around the house to create a huge spider for the inside or the outside of your house. You can make it fun or scary. All of the directions for this spider are posted on Listotic. This has to be the cheapest and easiest craft idea. I can't believe I have never thought of this before. Just take a toilet paper roll and cut out different eyes and stick a dollar store glow stick in it to hang outside. These perfect decorations are from Her Campus. This is another fun craft to do with your recycling at home. Paint some cans green and black and add some wine corks and googly eyes and you will have your very own Frankensteins for Halloween. You can find this idea at Brew My Tea. What homemade Halloween decorations have you made in the past Moosers?